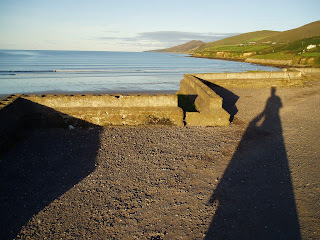 Self portrait on Inch Beach, Ireland, September 2005. I have not forgotten you, unless you are someone I have forgotten. Grin. I'm sure there are billions of things I would have told you, had I blogged the first 10 days of this month, or the last 2 of last month. Sorry. I can't tell you any of them any more. Gone. Ftttt. Kaput. Except I will tell you I had much funs in Minnesota & that my future-daughter-in-law is a stupendous massage therapist. Yesterday I wrote a new little quantum fizzixy story (longhand, since my computer is wonky) & worked on a painting & did some collaging & drawing in my journal. I stepped outside only to put a couple items in the recycling bin, just cuz I was so busy doing. Didn't even get the mail. Today I popped out & did that & drove to Weaverville to walk around. Funnest thing I saw there: 3 shaggy ponies, in a pasture a block from the main drag. I did follow the trail of one "for sale by owner" sign, but it ended up being a boring-looking house with 2 EXTREMELY yappy dogs for next-door neighbors. I'm thinking Weaverville is probably not where I'll end up, but it was fun to look at anyway. The real reason I blogged today was so I could have Blog alternative 111 on 11 January, or, as many people put it, 1/11. So, here goes. 111. Walk or drive past a house that's for sale & make a list of the reasons why you would buy it, & the reasons why you wouldn't.